Fastest ever pizza delivery......problem is your Ferrari smells of pizza. does it have UK plug ? No, but that's not really a big deal is it? Adaptors are readily available and cheap. Hot, bought one from Amazon Italy a month or so ago , arrived quickly and no problems. It works well, but does get very very hot, so still trying to adjust to that. 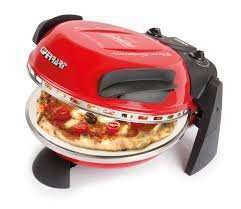 I have a normal oven which cooks pizza so why would I need to buy another gadget just to cook pizza waste of money !!!! you need to click on the standard delivery option.. I have a normal oven which cooks pizza so why would I need to buy another … I have a normal oven which cooks pizza so why would I need to buy another gadget just to cook pizza waste of money !!!! WOW you sound like a happy person. Your relatives will be happy too when you leave them all the money you didn't spend. Oh god not this again..
How is this better than an oven? I believe it heats to a much hotter temp. It gets a lot hotter than an oven. 390c. Crispy base and cooked toppings with a soft dough in between. You need to make your own. But these are really good. My Mrs was skeptical of me wasting my money. She's a convert now. Pizza is on the menu every week now. But you must make your own dough!! I think I will purchase this oven and put it with the Sandwich Toaster, Soup Maker, George Foreman Grill etc etc. Its only free delivery within Italy otherwise its £58.04 delivered. I would suggest that this deal may not be right for you. Cheer up, Christmas will be here soon. What size pizza do they do? Disappointed with mine. The stone plate has developed a 4 inch hairline crack almost immediately and it's probably not too long before it fails completely. It burns too easily and the only way to clean is to leave on high heat to burn off the residue - not very efficient. I purchased from Amazon.it the other day, Amazon UK had taken the item down some time ago and it was still under review - looks like it is back up now. Anyway, despite me ordering from Amazon.it it was dispatched from the UK and arrived the next day, even though I'd selected the cheap delivery option on Amazon.it! I thought the same thing, it was the first thing that jumped out at me flicking through the book, I did find it odd that there were so many recipes for pizza - just chuck what you want on! To clarify, the recipe book is Italian, the instructions and manual is in all EU languages, including English. The pizzas this machine make are like the Ferrari of the pizza world. Really? That's common where I'm from. A chip pizza is called a London. It gets a lot hotter than an oven. 390c. Crispy base and cooked toppings … It gets a lot hotter than an oven. 390c. Crispy base and cooked toppings with a soft dough in between. You need to make your own. But these are really good. My Mrs was skeptical of me wasting my money. She's a convert now. Pizza is on the menu every week now. But you must make your own dough!! Care to share the recipe for the dough? Rather have it from a real person than a random website, I'm sure you'll have it down to a T.
Just under £60 would be a more accurate description! Btw.....pizza one of the most boring foods on earth. My friend told me about the London pizza. Made me laugh. Then he told me about the Teesside pizza, a pizza with half chips half doner meat covered in cheese! Just under £60 would be a more accurate description! 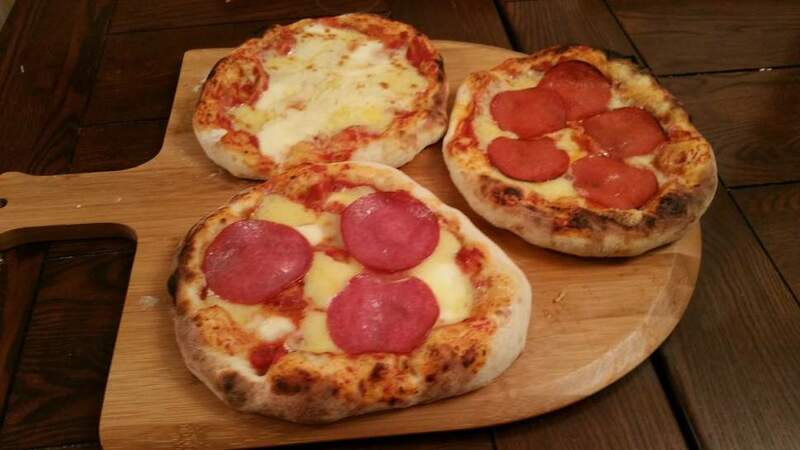 Btw.....pizza one of … Just under £60 would be a more accurate description! Btw.....pizza one of the most boring foods on earth. Given that the possible combinations of toppings is huge, pizza is not at all boring - unless you eat it too frequently or have no imagination. I've saved a fortune, no more wasted money at Pizza hut or dominos. Worth every penny, also if there are a lot of YouTube videos with Italians reviewin the item then it should be good. Bought this last week and it is amazing ! Pizza in 5 minute and restaurant quality ! I use Jamie Oliver pizza dough recipe and also his tomato pizza sauce recipe - a 10inch pizza freshly made in 5 minutes for £1,50! I bought this in August for my wife's birthday and we have nearly gone through a 25kg bag of Caputo pizzeria flour since! We have 2kg left. I have used a lot making bread along with pizza probably once a week, but its saved a lot on shopping trips purely for bread. The pizza dough does keep sat in the garage for maybe 4-5 days. (Which is off the kitchen) probably longer! 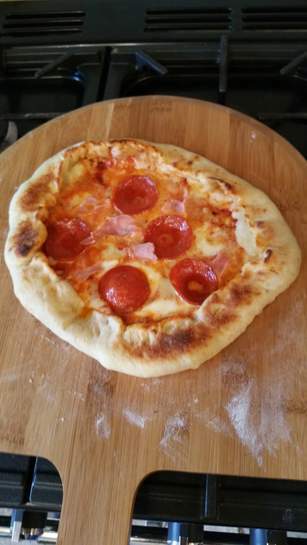 For a cheap quick meal whipping up a pizza with a dough ball and pasta sauce and grated mozzarella topped with a bit of salami and whatever else takes minutes. Garlic bread with cheese pizza bases are also nice. Literal must cost under 20p per garlic bread and 50p per pizza if buying in bulk! If you have a bread machine, its really easy! Just do the dough in there, and portion up for a second rise. Look on YouTube, or the previous thread! It really is the best thing we've bought for the kitchen. It will offset the ripoff nespresso machine I've bought for my wife for Christmas! 30p per coffee! Although I must admit its nice. Havent tried dominoes but we make our own. The Mrs is Polish and they love their garlic or ketchup on Pizza. Basically 50% Creme Fresh 50% mayo and garlic obviously, add pepper/salt . Just vary the mix to your own liking. Madness, in Italy its usually called an American pizza! I tried it, was not amused, locals love them tho? Deal posting newbie! This is AB89 first deal post. Help out by leaving a posting tip or just to show your appreciation for their contribution.